Designed by renowned Swiss company Intamin AG in 1997, the Tower of Terror (ToT) was the first of its kind in the world to use magnetic linear induction motors (LIMs). It was constructed at a cost of USD$12 million – while the cost of erecting the tower alone totalled over one million dollars. Peaking at 38 storeys high (115 metres), stretching the equivalent of three football fields across the Park (330 metres), in 1997 ToT achieved unprecedented speeds of 160 km/h. Riders rocket up the ToT’s 115 metre tower before free-falling back down to earth backwards, while experiencing 6.5 magnificent seconds of weightlessness. Although the ride itself lasts little over 15 seconds,accelerating from 0 to 165km in just over 3 seconds, all you can hear is the loud roaring wind, while your eyes water as you struggle to keep them open. Before you realise, you’ve turned 90° into the air, soon plummeting backwards down the 38-story tower. The electro-magnetic acceleration bricks are reversed – stopping the 15-person vehicle back at the loading station within 3 seconds. To generate these intense speeds 2,200,000 watts (2.2 megawatts) of power (enough to power a small town) is applied for six or seven seconds. This momentarily doubles the park’s total power usage. Electro-magnetic forces propel the vehicle progressively faster until it reaches top speed. The 300 metre horizontal track has a series of increasingly powerful magnets, forcing the metallic passenger vehicle forward with in a series of electrical charges. These magnetic forces are then reversed brake the vehicle to its dramatic deceleration. These magnets are so powerful that it would take a winch to prise them apart if their opposite poles were ever joined together. More than 600 tonnes of steel were used to construct the Tower of Terror, with around 450 tonnes for the 115 metre tower alone. “Tower of Terror” is spelled out on the ride’s 115 metre tower using 4.5 tonnes of steel. Each letter measures between 1.5 and 2.5 metres wide and high. It took around 3,500 litres of paint to coat the ride’s exterior. The vehicle weighs around six tonnes. Its wheels measuring 600 millimetres in diameter at the front and 900 millimetres at the rear. Five kilometres of electrical cable are used to ensure the ride’s power source. On February 7, 1997 Dreamworld’s Tower of Terror officially held the world speed record for a ride reaching a speed of 162 kilometres per hour (101 mph) on a Police calibrated hand-held radar gun. 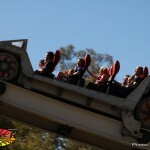 Dreamworld CEO, Mr Fred Maybury dismissed statements made in the media that “Superman – the Escape”, at Six Flags Magic Mountain in Valencia, California had exceeded Dreamworld’s world speed record “The fact is, by design, both rides are identical reverse free fall rollercoasters and not designed to achieve a speed greater than 161 km/hour (100mph) and operate safely,” Mr Maybury said. 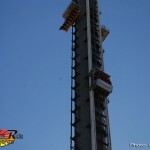 This has been confirmed by the ride’s manufacturer, Intamin AG of Switzerland. this is such an awesome ride. scary as hell, though. I sh** my Spongebob boxers on this ride. OMG! There is also a ride called the Tower of Terror at Gold Reef City, South Africa. Operating since 2007. Designed by Ronald Bussink. Uses an old lift tower from a gold mine. 59mph, 90 degree vertical drop, 6.3 G-Force. Most thrilling ride there! If they are electro-magnets, why would you need a winch to pull them apart? Both coasters use LSMs (linear synchronous motors) rather than LIMs. The LSMs use far less electricity but require a far greater computer control system to operate correctly. BEST RIDE EVER!!! it goes heaps faast!!! This ride produces 2,200,000 watts (2.2 megawatts) of power, enough to supply a small town. This momentarily doubles power usage at the theme parks. I personally think thats a wast of energy just for a thrill ride. 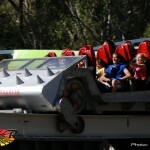 OMG, that ride is awesome, after i got on it once i got on it again . i was in florida!!!!!!!!!!!!! i would love to ride this!! I recommend if u hate the dropping stomachs turning feeling, don’t go on it!! I went on it and I hate the dropping feeling! I screamed like a little girl!!! So did Six Flags “steal” this design for Superman the Escape? These photos are of the original Tower Of Terror, and now they made it backwards.